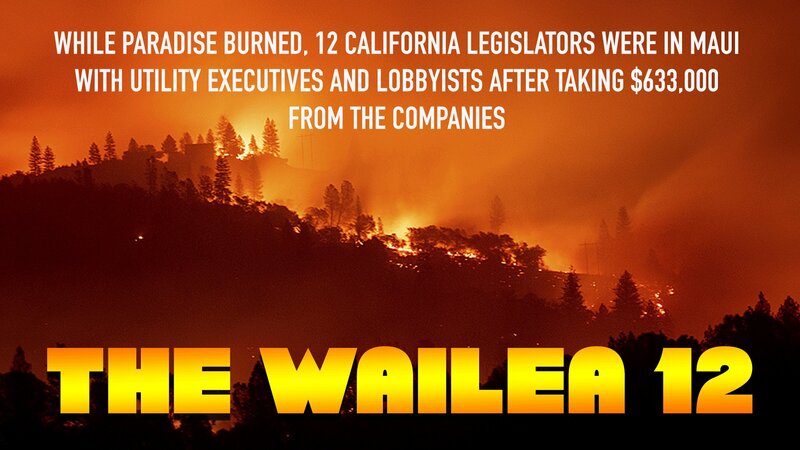 As wildfire victims fled for their lives in Paradise and Malibu this November, utility executives and lobbyists for California's big utilities were wining and dining 12 influential state legislators in a different paradise -- Wailea, Maui. The New York Times broke the story about the junket and the discussion about the wildfires there, which had to include the the inevitable bailout for the utilities that helped spark the blaze. Edison and its executives had a captive audience with the 12 Wailea legislators around the pool at the posh Fairmont Kea Lani as the Woolsey fire devastated Malibu. PG&E executives had paid for their seat at the luau, but decided not to show as the Campfire raged and their equipment was fingered as a possible cause. Executives from SEMPRA, parent of San Diego Gas & Electric, were there too. The "Wailea 12" received more than $600,000 from the utilities in campaign contributions. They are part of the key committees deciding the fate of legislation determining who pays for wildfires -- utilities (whose equipment was at fault), insurance companies, ratepayers or taxpayers. The tragic irony is the host, the so-called Independent Voter Foundation, is headed by the architect of California's disastrous electricity deregulation experiment, former state senator Steve Peace. Peace is the last person legislators should be taking advice from, his advocacy of free market electricity brought us Enron and the last utility bankruptcies. The ink is barely dry on the ratepayer bailout of utilities over the 2017 wildfires, grudgingly passed on the last night of the legislative session in September. Already the utilities and their advocates are pushing for a new bailout in Sacramento over the 2018 fires. Assembly Member Chris Holden, Chair of the Assembly Utilities Committee, said he would introduce such legislation. Holden was the recipient of Peace's same freebee junket to Maui in November of 2017, according to his statement of economic interest forms filed in March 2018, right before co-chairing the legislative conference committee that pushed through last session's bailout. It's shameful that while wildfire victims fled for their lives, and many lost them, legislative policy about the wildfires was being made over Mai Tais in Maui with utilities executives and lobbyists. Such junkets should stop, and the recipients should pay a big price for their fealty to the utilities over the ratepayers, homeowners and taxpayers. With a new governor comes new opportunity for new ethics in Sacramento. Only more public scrutiny and a public backlash will change business as usual though. Will the Wailea 12 pay a price? Stay tuned. UPDATED 1/8/19 -- The New York Times this morning in its California Today Newsletter named the 12 state legislators -- "Those attending the gathering included the assembly members Tom Daly, Frank Bigelow, Bill Brough, Jim Cooper, Heath Flora, Jim Frazier, Reggie Jones-Sawyer, Freddie Rodriguez, Blanca Rubio and the majority leader Ian Calderon, as well as Senators Ben Hueso and Cathleen Galgiani, according to the Independent Voter Project, which organized the event."